A Rozgar Mela is an event where a number of employers and job seekers come together for the purpose of applying and interviewing for jobs. Defined more precisely, a Rozgar Mela is an employment strategy to fast-track the meeting of job seekers and employers. Rozgar Melas are typically held in large assembly halls with a booth for each employer. At the front of each booth is a table that displays company brochures and information. Usually, several company representatives staff each booth, standing behind tables as they talk to job seekers. Some companies decorate their booths with banners and signs. Rozgar Melas range in size from 5 – 100 employers with many hundreds of job seekers. Even small Rozgar Melas can be busy events with lines of job seekers waiting to see company representatives. 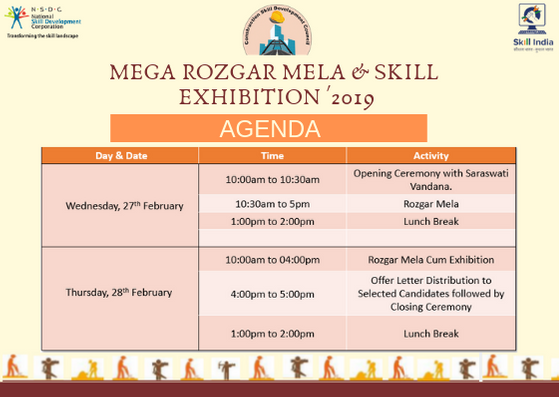 Rozgar Mela’ give an opportunity to job seekers to learn more about potential employers and various employment opportunities available, including entrepreneurship. It also offers a platform to the organisations to meet potential employees in an informal setting. The ‘Rozgar Mela’ brought skilled candidates in direct contact with recruiters, HR managers, admission officers and advisory bodies/training providers. 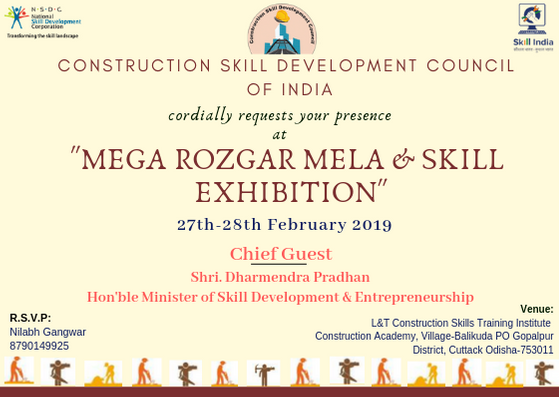 CSDCI is organizing a “Mega Rozgar Mela & Skill Exhibition” from 27th February to 28th Feb 2019 at L&T CSTI, Cuttack, Odisha. Shri Dharmendra Pradhan, Hon’ble Minister of Skill Development & Entrepreneurship will be the chief guest for the event. More than 3000 jobs will be offered by 15+ recruiters in Construction related job roles. The event aims to create better employment opportunities for the Construction Workforce. It will also provide networking opportunities for key decision makers from the construction industry.